British mobile network operator O2 today updated its cross-platform mobile payments and price comparison app, O2 Wallet, so that users can now add credit to up to five different ‘Pay & Go’ mobile numbers simultaneously using a stored bank card. Available on iOS, Android and BlackBerry, O2 Wallet can be downloaded by anyone, regardless of what bank or mobile network they’re currently on. The caveat is that top-ups can only be applied to an O2 Pay & Go mobile number; so a Vodafone customer could download the O2 Wallet app and add some credit for an O2 Pay & Go customer, but not the other way around. 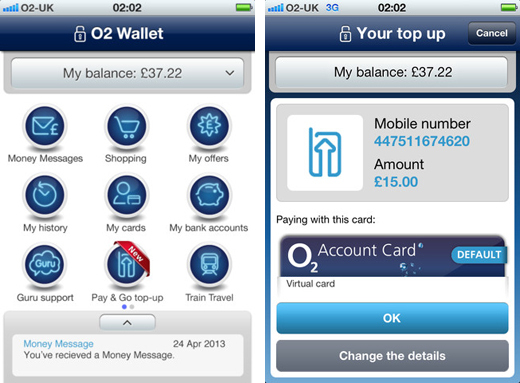 The new ‘Pay & Go’ top-up feature has been added as an additional icon on the O2 Wallet home screen. To get started, users will need to set up an O2 Wallet account online, or register as an O2 customer by texting ‘WALLET’ to 61202. Once everything is set up, the user can choose a number to top-up from their phonebook, as well as the desired amount and which credit or debit card they would like to pay with. O2 Wallet was launched in April 2012 and lets users send money to another mobile phone number in the UK via a simple text message. These ‘Money Messages’ can range from £1 to £500 and are designed to make lending, borrowing and repaying money a whole lot easier. The app can also be used to scan product bar codes, before comparing the price with over 100 online retailers. There’s also a number of daily discounts and deals nestled under the ‘My Offers’ icon. The company also launched a separate app for rail travelers earlier this year, called O2 Train Travel, for iOS, Android and “most BlackBerry devices”, which integrated with O2 Wallet for faster mobile payments.